Whenever an old story is revisited, or an existing film remade, the inevitable question arises: Why? As I am sure will be asked of the new Wuthering Heights and Great Gatsby adaptations. Will it deliver upon some improvement, offer a fresh perspective, or generate surprise at its uniqueness despite familiarity? 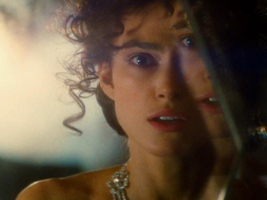 The answers to all questions concerning Joe Wright’s Anna Karenina is yes, emphatically so. Wright is no stranger to adaptation, in fact his films to date are mostly thus. He has been proving his cinematic savvy for years now, and is even more acutely aware of his aesthetic language. Wright has honed a strong sensibility when it comes to visual metaphor, and uses them to enhance his storytelling, rather than to adorn it. I will spare details of the story because history has offered them up already, but writer Tom Stoppard has consolidated them into a concise yet expansive formulation that rarely stops for a breath. The film itself, as an emotional-sensual-visual medium is particularly crazed and highly sensuous. More than almost any other film, it is a dream. Wright recalls the best elements of G. W. Babst’s Pandora’s Box (1929), what with its choreographic sensibilities (consider the backstage scene in which Lulu threatens to leave the show and halt production in mid performance, while stage hands and actors whisk around), and its trajectory of a woman’s “moral” decline. Karenina also recalls a more contemporary influence in Wes Anderson, for many of the same reasons of controlled, choreographed flurries of human and environmental interaction, but also the inclusion of theater, which could as easily draw comparison to the first episode of Bergan’s Fanny And Alexander. The unexpected sense of humor that enlivens the first parts of the film too bear a kinship to Anderson, delivered by a scene-stealing mustachioed Matthew Macfayden. Interesting to note that while he plays Anna’s brother Obronsky, in Wright’s Pride and Prejudice, Macfayden and Knightly are lovers. All the film’s a stage in Anna Karenina. The scenes and sets change around the actors as scenes unfold and it produces such a seamless merging of environs and emotional states that it is intoxicating. The craft of these sets gives a sense of their falseness, but to the perfect degree, in which one both recognizes them as sets or stages and yet accepts them as a distinctive reality that warps time-space rules. The theater of Karenina is the heart of its uniqueness and works for the story in its propellant effect, its visual appeal and complexity, as well as imparting the sense of “lived drama,” or the “theater of life” if you prefer. Keira Knightly is at home in Wright’s direction and in the slightly insane dreamworld that Wright has constructed seemingly around her. She is in tune with her character completely, and it shows in the subtlety of her gestures, and the overall believable nuance of her self-destructive course. Speaking again of Pandora’s Box, Knightly’s bodily performance could easily stand the test of silence, and brings to mind those fleeting and real moments that Louise Brooks was capable of. The film might fall apart at the seams if not for her authenticity, because her trajectory of self-ruin is the story to an extent. Her arc serves as the epic-center around which a ripple effect of moral questioning, perspectives on love, and the dregs of emotional being, are articulated, particularly by her more conservative intellectual husband played by Jude Law in what is easily one of his best performances. This is definitely worth a look, and what a look it is. Anna Karenina is now playing at the Ritz East.